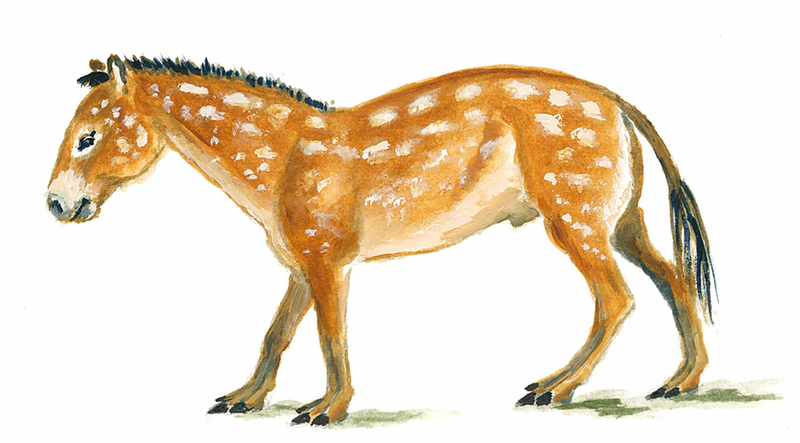 Living during the Eocene era approximately 55 to 58 million years ago, Eohippus, the “dawn horse” or more correctly called Hyracotherium, is the most ancient ancestor of today’s horse. From this species descended many “horse-like” animals that make up the “family tree” or in this case, the family bush of the horse family and its cousins. Its head was short and the eyes were in the middle of the skull. Its back was rounded and it may have had a striped coat for camouflage. It lived in the Old World and in North America. Eohippus had 4 toes on each front foot and 3 toes and a splint bone on the hind feet. It stood about 12 inches tall at the shoulders. It is hard to estimate the weight but some researchers have suggested that the weight of Hyracotherium may have ranged from the size of a domestic cat (3-5 kg) to a much larger animal of 25-35 kg (MacFadden). Its teeth were low crowned and included a large canine tooth, probably used for fighting for females for the harem. It fed on herbaceous plants and may have followed seasonal migrations. 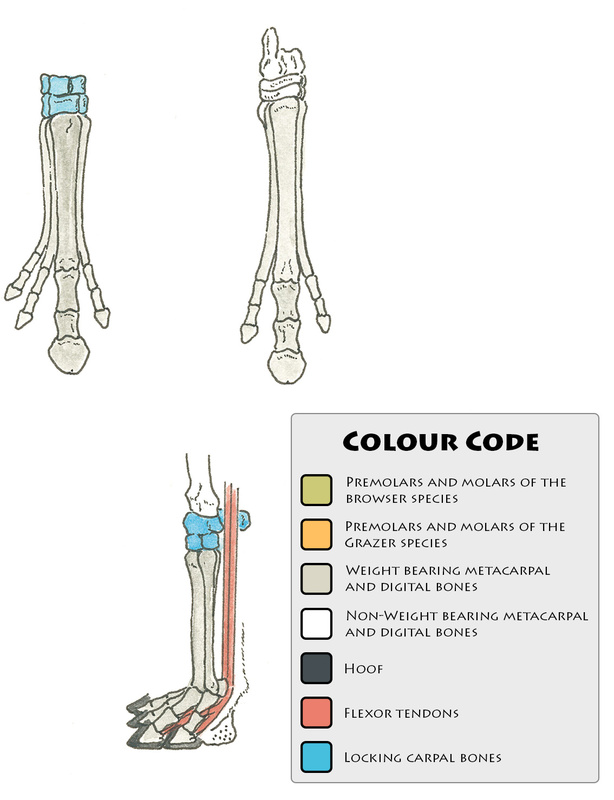 The lower limb bones, called the radius and ulna are not fused together as in the modern horse but are distinct as two separate bones – this permits some rotational movement and may have been helpful in moving through the uneven terrain of the forests. Hyracotherium may also be the ancestor of the other perrisodactyls (hoofed odd-toed animals) like the tapirs and rhinos, and the extinct strange chalicotheres and enormous titanotheres.